How large of an area will it take to plant your Large Family Seed Collection that sells for $79.00. Please give me an idea as to how much space is needed, tight and not so tight. For the Large Family Seed Collection, we would probably recommend a garden of around 6,000-8,000 square feet. If you must have the plot smaller than that, one way to help maximize your space would be to plant vining plants around the edges, and train them outward as the vines grew. And you could “block” plant things like beans and peas. Looking into “Square Foot Gardening” may be a big help in fitting in as much vegetable and fruit varieties in as little space as possible, and you may be able to get by with a little less space than what we recommend. 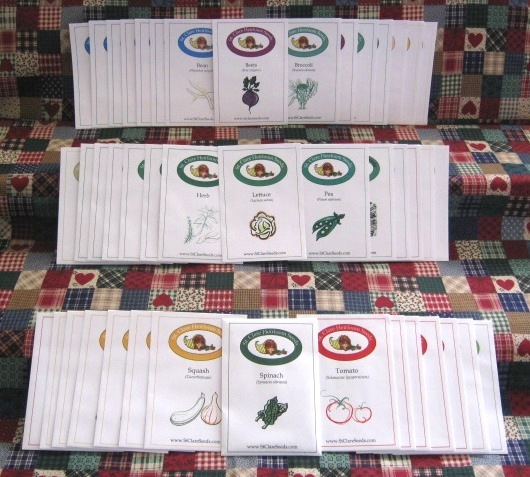 The Large Family Seed Collection is the perfect package for the large family, market grower, or a community garden. A large selection of our best all-around vegetable and fruit garden seed varieties, all open-pollinated, non-hybrid, and Non-GMO. We have selected varieties that should generally do well in all areas of the U.S., as well as varying soil and light conditions. Packed with a great balance of fresh and canning fruits and vegetables to supply your family with high nutritional value for a year, this package will fill a large garden plot with delicious home grown goodness.